Extend the range of your home Wi-Fi signal and eliminate dead spots using the Linksys N300 Wi-Fi Range Extender (RE3000W). The RE3000W can be plugged into a standard wall outlet to bring wireless Internet connectivity to the far reaches of your home, with a range of up to 5,000 square feet. An Ethernet port allows you to establish a wired connection to a desktop or laptop computer or another Internet-capable device. 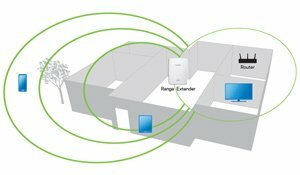 The extender eliminates dead spots and works with virtually any Wi-Fi router. View larger. The RE3000W brings wireless Internet connectivity to the far reaches of your home with a range of up to 5,000 square feet. View larger. The RE3000W is compatible with virtually any Wi-Fi router or gateway. Simply connect it to your current wireless network to enjoy Internet access on all your devices, from anywhere in your home. With the Linksys N300 Wi-Fi Range Extender (RE3000W), you can easily expand the range of your existing wireless Internet router. The device features a single wireless band of 2.4 GHz and can deliver data transfer speeds of up to N300 Mbps to extend your Wi-Fi. Simply plug the device into a standard wall outlet where you need Internet connectivity--say, an upstairs bedroom or office or another remote area of your home. The RE3000W repeats the signal from the router and redistributes it to reduce wireless dead spots. 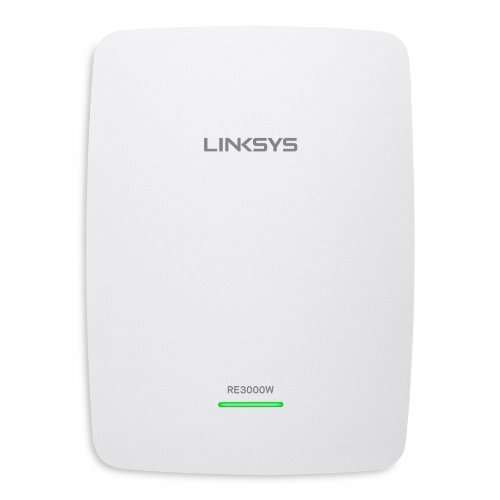 In addition to wireless connectivity, the RE3000W features a Fast Ethernet port, allowing you to establish a fast, secure wired connection to a desktop or laptop computer or virtually any other Internet-enabled device. 1. Connect the power cable. 3. Wait for a solid light on the cover of the range extender. Then, on a computer, phone, or tablet, connect to the Wi-Fi network "Linksys Extender Setup." This product requires a wireless router or access point, as well as a Wi-Fi-enabled computer that has an Ethernet port and that runs the Microsoft Windows XP SP3, Windows Vista SP1 or later, Windows 7, or Windows 8 operating system or the Mac OS X Leopard 10.5.8 or later, Snow Leopard 10.6.1 or later, Lion 10.7 or later, or Mountain Lion 10.8 or later operating system. 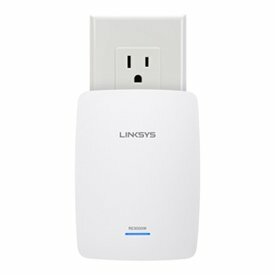 Linksys N300 Wi-Fi Range Extender (RE3000W), power cord, power connector cover, Ethernet cable, and quick installation guide. An Ethernet port allows you to establish a wired connection to a desktop or laptop computer. View larger. Mac OS X Leopard 10.5.8 or higher, Snow Leopard 10.6.1 or higher, Lion 10.7 all versions, Mountain Lion 10.8 all versions. Mac users running OS X 10.9 or higher will need to use manual configuration to set up the Linksys RE3000W. A firmware update will release soon to enable full compatibility with OS X 10.9 or higher.